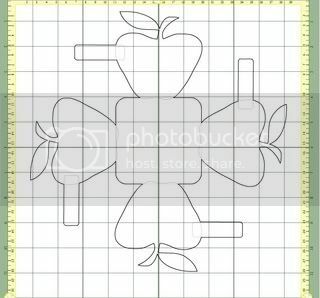 Cricut CraftRoom Blog: Apple Basket and our first challenge! I wanted my basket to cut on one 12x12 paper, so I decided on 3.5 inches for the size. 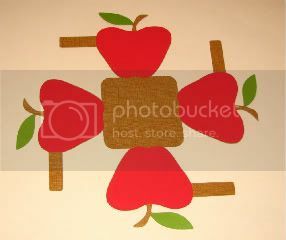 I chose the apple from Plantin and put it on the mat. Using the sizing handle, I stretched it to also be 3.5 inches wide. 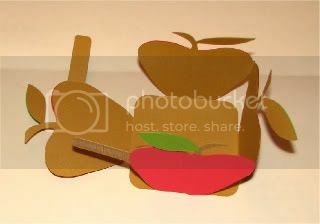 I then added a small rounded rectangle from George and welded that to the apple on the left side. 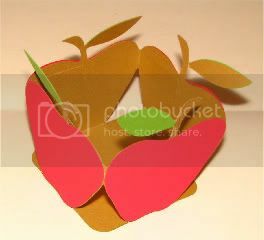 I then cut the design using brown cardstock. 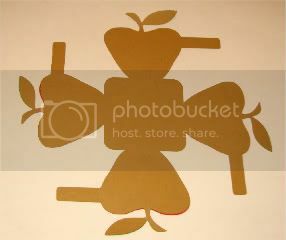 I copied the apple image and placed it on another layer in CCR. 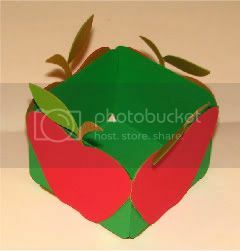 Since you can "see" where the image will cut, I placed a strip of green paper across the top of the mat (where the leaf and stem would cut) and red paper underneath (where the apple would cut). I cut 4 of each and used scissors to trim away the stems. Then I glued them onto the brown box. I scored the box along the bottom of the apples and on the tabs. Added adhesive to the tabs and folded the basket together. You can also add a handle if desired. The finished basket is great for a baggie full of candy or a few school supplies (crayons, glue sticks, erasers) or a muffin or even an apple! And if you have items that may fall through the openings, you can created a liner for the basket. I used the rounded square from George, welded them together and cut the design in green. So, how about a challenge???? We'd love to see your version of the basket! Put one together and post a picture of the finished product using the Link button below. You can use any shape from any cart you like so long as it uses the same general design as above. We can't wait to see all the different designs! We'll use Random.org to select a winner from the entries. The winner will then be able to select a cartridge of their choice from Cricut Rewards (including those available to the Cricut Circle members). Submissions will open on Wednesday 31st August at 8:00am Eastern Time and close on Tuesday 6th September at 10:00pm Eastern Time. We're trying out a Linking tool so please let us know if you have any problems! Great idea! I will try to get one made and posted. Thanks! Love the basket Paulette, super cute idea for a teacher! Can we only play this challenge if we have access to the Cricut Craftroom? I have followed the blog to learn how to use it but as yet still don't have access to it. Oh I take that back I am now in but the images are not loading, I will try it on my other computer in the morning and see if that works any better. Got myself a design put together now I need to cut it out and embellish it. 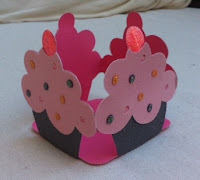 I think it will be a cute little gift for a princess on her 1st Birthday! What does it take to gain entrance to the Craft Room. I feel very frustrated!! I just posted my basket. What a fun way to learn and share. I just noticed on my link it put http// in it twice so won't open to the photo should I delete it and then reload it up again? Hi Westside Quilters Group. Have you tried to access CCR lately? Lots of Cricut.com members seem to have gained access in the last week or so without having received an invitation email.